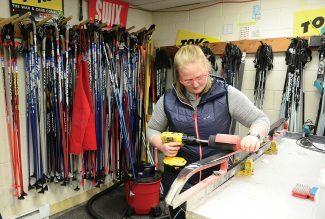 Kajsa Lindgren stays busy getting skis ready for the season in the wax room at the Steamboat Ski Touring Center. The shop is open and ready for customers despite the fact that the Touring Center still needs several inches of snow before it can open for the season. Until the snow arrives, Lindgren said the shop will be open from 9 a.m. to 4 p.m. daily, and the staff will try to stay busy renting skis and getting equipment ready for when the snow starts to fly. Once the snow comes, the shop will extend its hours until 5 p.m.
Lindgren said she is trying to stay upbeat and realizes she has very little control over what the weather will do. She said people are skiing on top of Rabbit Ears Pass, and Bruce’s Trail has given skiers a chance to get some early season snow under their skis at the higher elevations. But until the snow started falling early Monday morning the scenery around the Steamboat Ski Touring Center was a little too green for Lindgren’s taste. The Steamboat Ski Touring Center’s 14 employees are currently on hold, and a decision will have to be made on whether or not the center can host the annual Steamboat Nordic Camp, which is scheduled for this weekend. That camp was supposed to take place Saturday and Sunday and is put on by Emily Lovett and Katie Lindquest to grow interest and build a community for cross country skiing and snowshoeing in Routt County. Lindgren said the trails at the Touring Center got about 2 inches from the last storm, but she said she needs between 8 and 12 inches on the ground before she can start preparing trails. 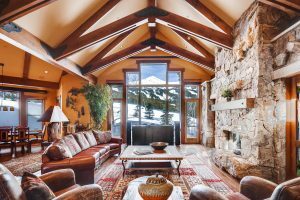 She said the shop is open and filled with the latest skiing gear, and some people are renting skis and heading to the top of Rabbit Ears in search of snow. The Touring Center is also offering ski waxing punch cards, which are normally five waxes for $65, at half price. Those punch cards can be purchased for $32.50 through Dec. 15.